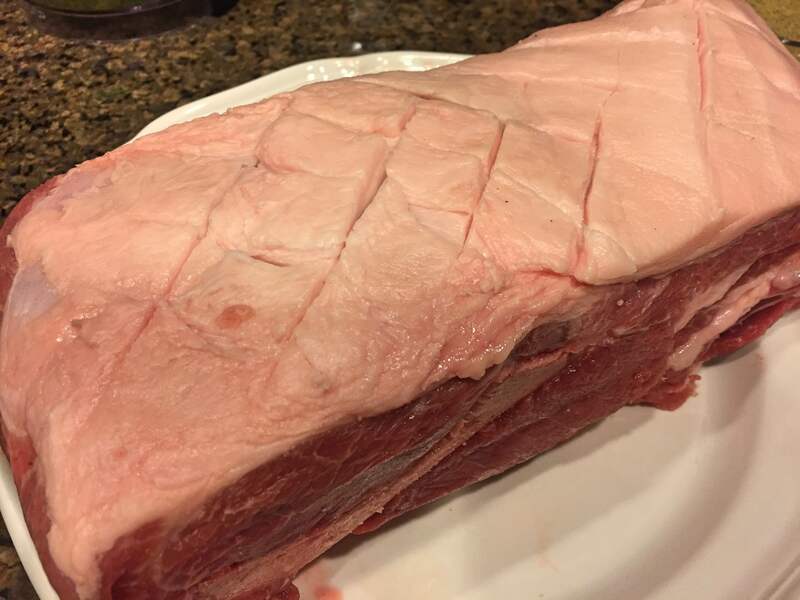 Having moved from New York City to San Diego a little more than a year ago, I’m amazed by the frequent sales my local Ralph’s grocery has on meat: sales like 2 for 1 on chicken, 50% off on shell steak, and the one responsible for this post $1.99/pound on fresh pork shoulder. 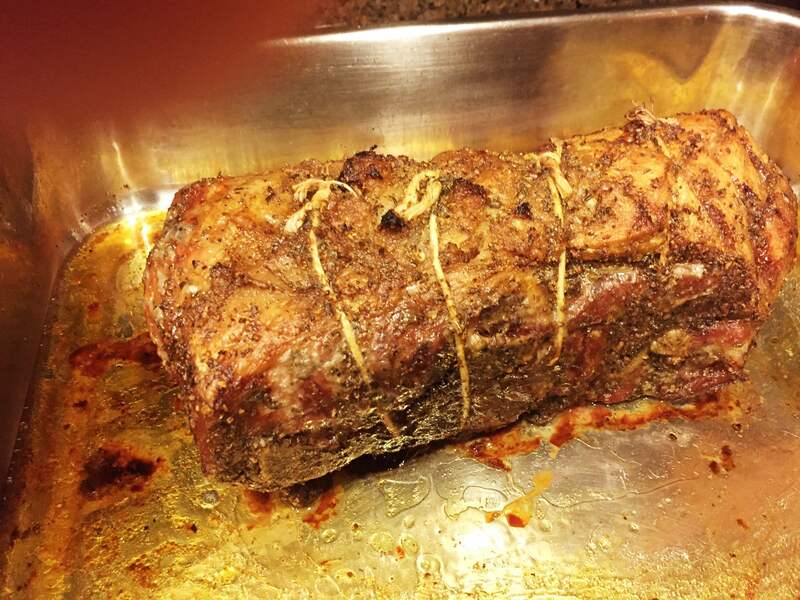 When I saw a well cut four-and-a-half-pound shoulder roast for a $9 and change, I couldn’t resist. Although I’ve never made one before, I’ve often read how tasty they are especially when cooked low and slow. 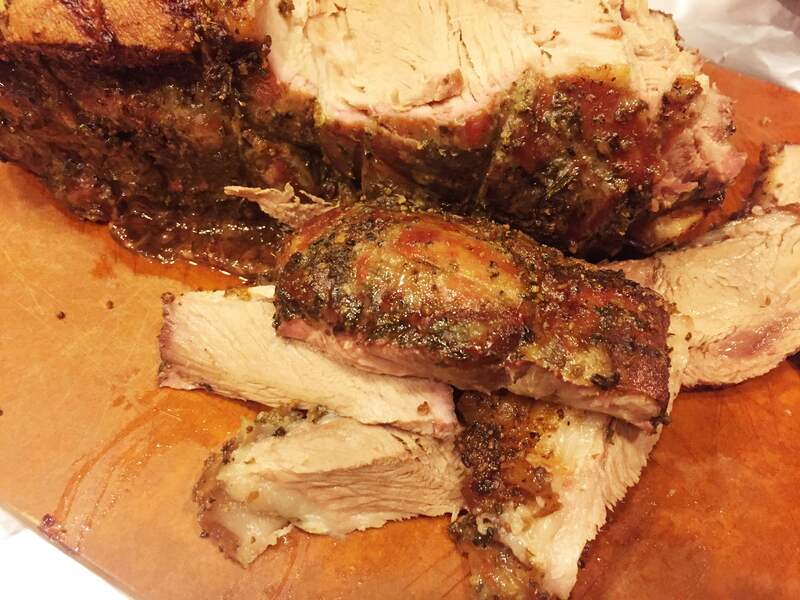 Because my husband had been asking me for a porchetta-style roast and thinking that I could fulfill his request with this bargain pork shoulder, when I got home I started to look through Italian cookbooks for a recipe, but had little success. Perhaps this cut of meat isn’t popular in Italy. 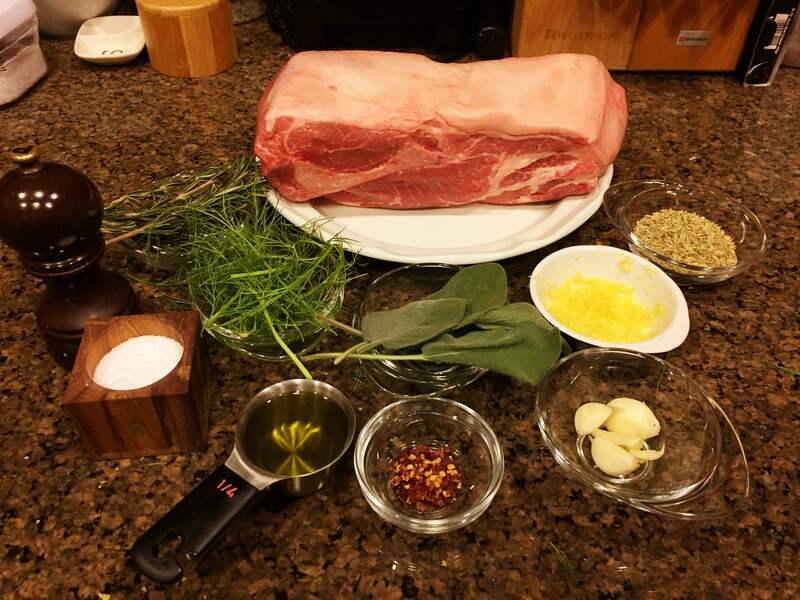 I then went online and found several recipes using pork shoulder that were based on this popular Italian street food. 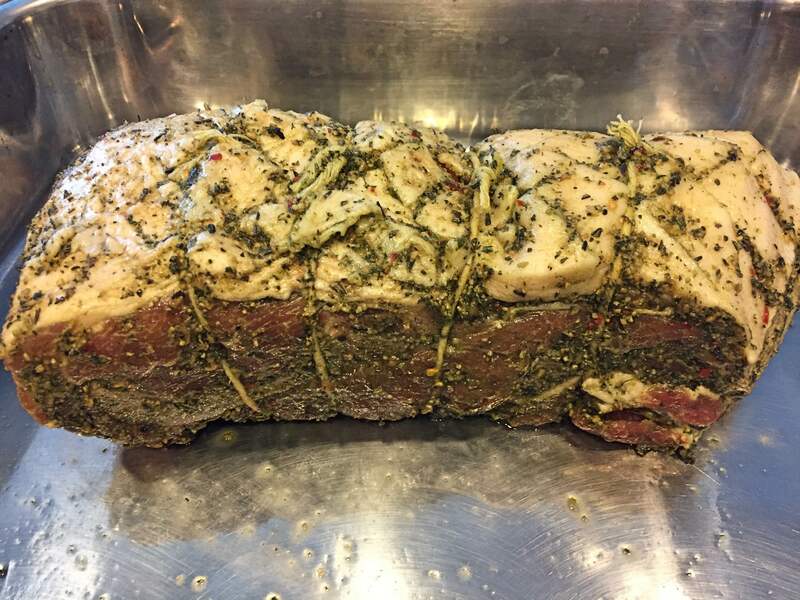 Scaled-down home versions of porchetta are typically made with a pork loin rolled into pork belly and seasoned with herbs and citrus. You can find a video of one being made here. 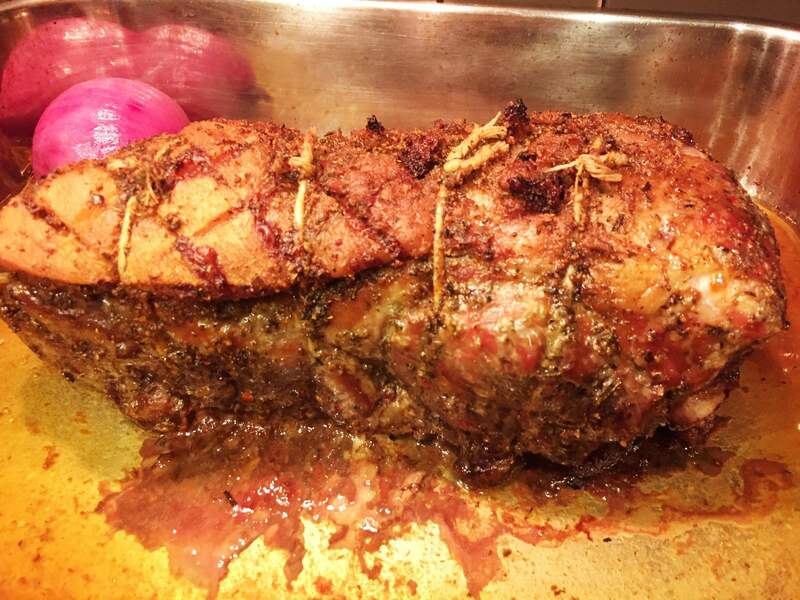 The roast I made yesterday, however, is a much simpler version that only approximates a true porchetta but nonetheless does deliver a lot of its intoxicatingly delicious flavors. I adapted my version from a New York Times recipe as well as one from Food and Wine. There’s minimal preparation, but with the overnight marinating and more than four hours of cooking, it’s a two-day affair. Indeed, the only difficulty with this dish is waiting patiently for so long while the enticing aromas whet your appetite as the meat roasts. The most significant changes I made to The Times recipe were influenced by the one on the Food & Wine website. They included increasing the amount of fennel seed from 1 teaspoon of fennel seeds to 3 tablespoons of finely ground ones and adding a cup of dry white wine to the pan just before the final hour of cooking. This final step, which you may choose to skip, adds moisture but may also slightly reduce the crispiness of the scored-fat cracklings. I should also point out that my cooking times were influenced by a reader’s comment to the Times recipe. 1) Using a very sharp knife score skin and fat all over pork, taking care not to cut down to the meat. 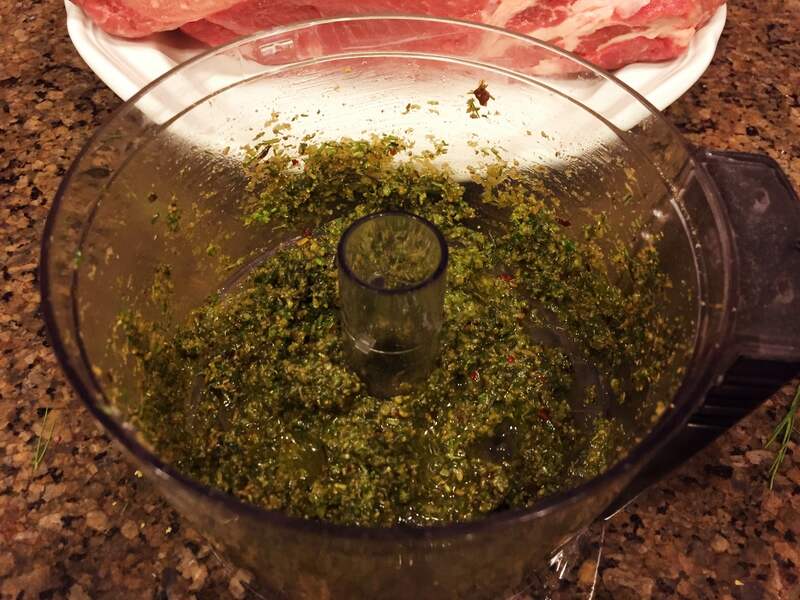 2) In a mini food processor, combine fennel fronds, rosemary, sage, garlic, lemon zest, salt, ground fennel seed, red pepper flakes and black pepper. Pour in oil. Pulse until it forms a paste. 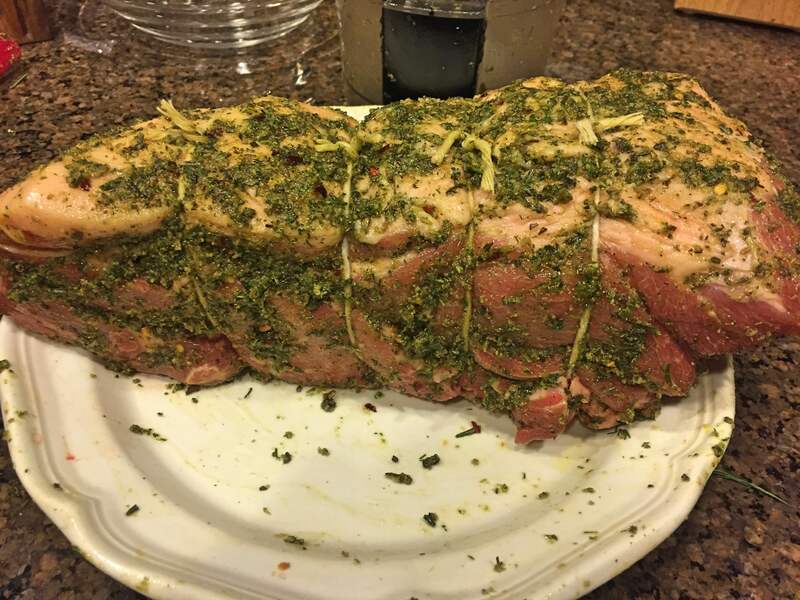 3) Rub all over pork, making sure to press the run into the scored fat. Tie with kitchen string at 2-inch intervals. 4) Transfer to a large bowl and cover with plastic wrap. Refrigerate overnight. 5) Remove pork from refrigerator 1 hour before you want to cook it. Heat oven to 450 degrees. 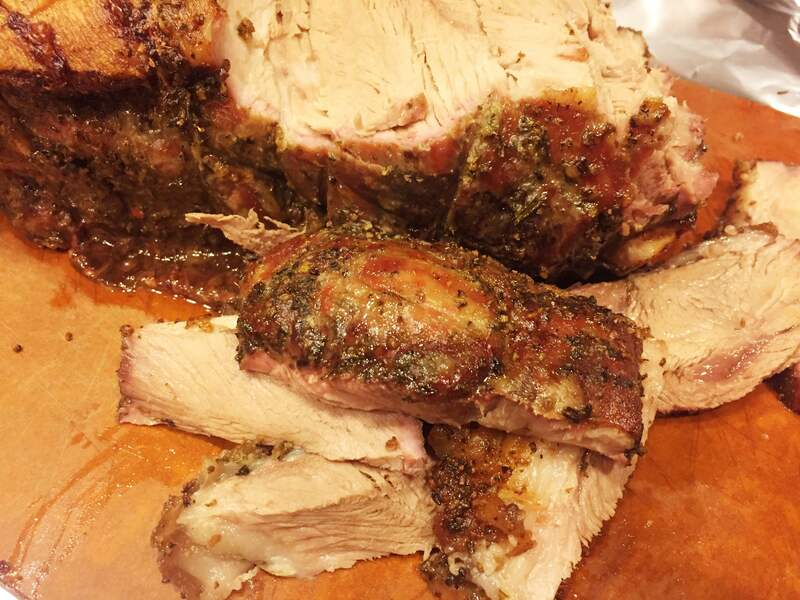 Transfer pork to a lightly greased roasting pan and roast for 25 minutes. Reduce the temperature to 275 degrees and cook an additional 3 hours. 8) Transfer pork to a cutting board and let rest for at least 15 minutes before serving. 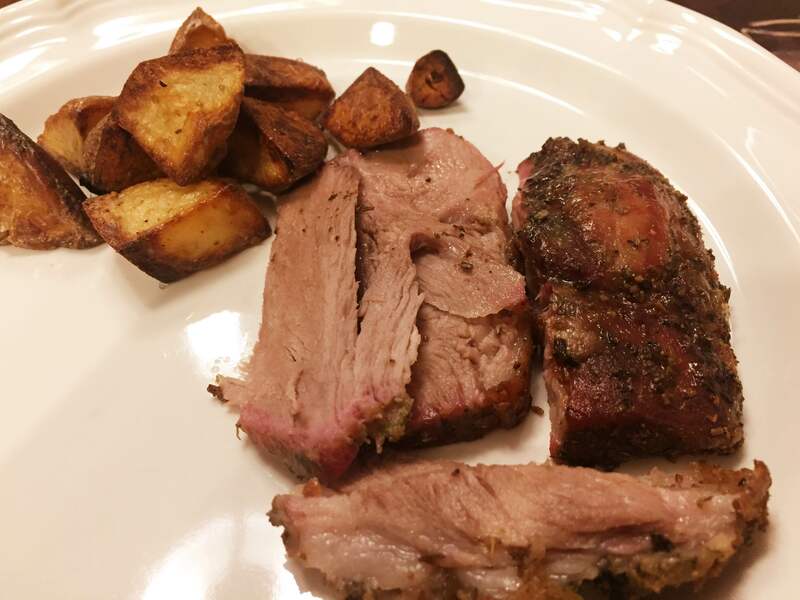 I served the pork with Italian style roasted potatoes. Looks fantastic! I have sometimes added fennel pollen to the rub as well. Thanks, Mark. I would have used fennel pollen if it were available here. I may need to mail order it.